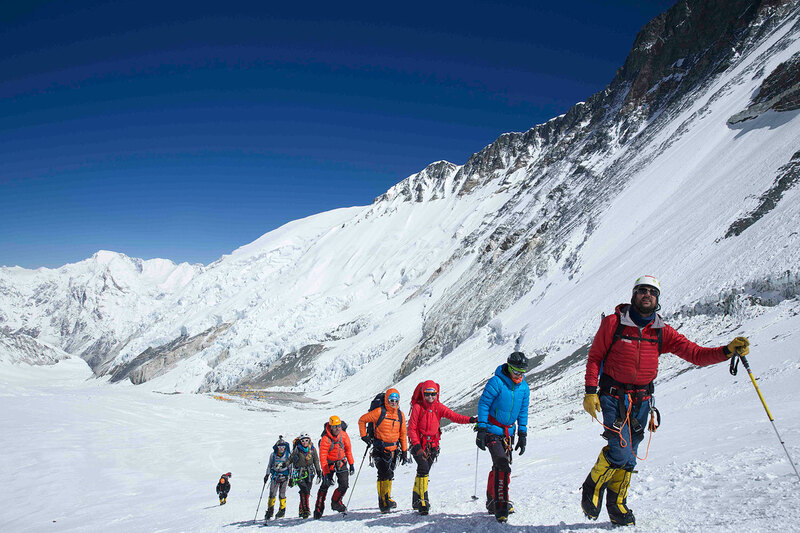 Want to learn more about climbing Everest, the highest mountain in the world? Contact us today and we will give you all the info you need. At 29,035 feet (8,850 meters), Mt. Everest is the worlds highest peak and one of the Prized 7 Summits (the highest mountain of each of the continents). The Sherpas call her Chomolangma or Mother Goddess of the Earth. So much history and culture has evolved around Everest that this trip has become the ultimate goal for many mountaineers throughout the world. 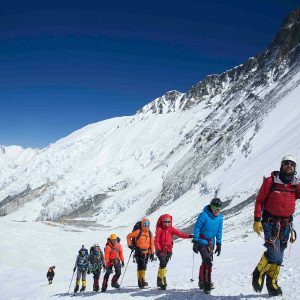 Join the Mountain Professionals Everest veterans for a privately organized and led expedition to the worlds most famous mountain. Our trip consists of high western staff to client ratio, 1:1 Sherpa to client ratio, and a small team mentality. We feel that this is a huge advantage in your summit chances and is backed up by our previous high percentage of summit success. 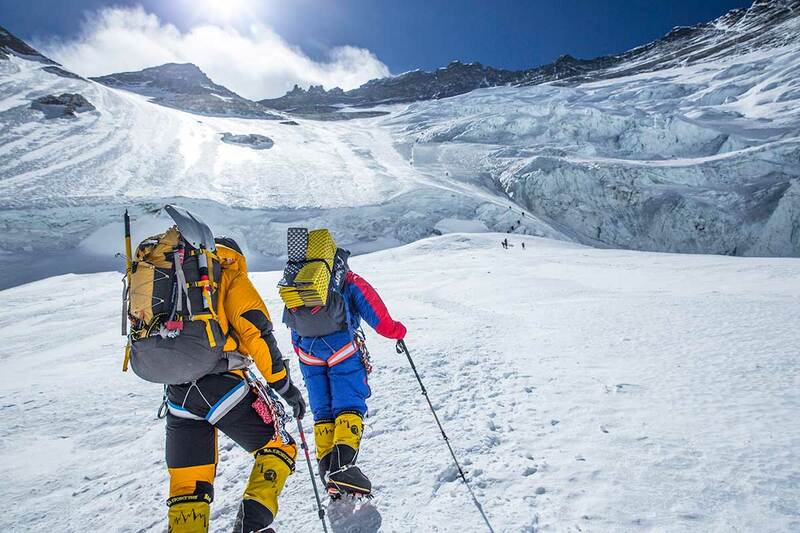 The Southeast Ridge of Everest, in Nepal is one of the classic routes in the Himalaya. 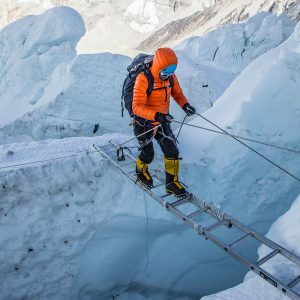 First pioneered by Sir Edmund Hillary and Tenzing Norgay in 1953, the route is accessible via the Khumbu Valley, leading to the famous Khumbu Icefall, the Western Cwm and eventually to the beautiful Southeast Ridge. The key to a successful ascent of Mt. 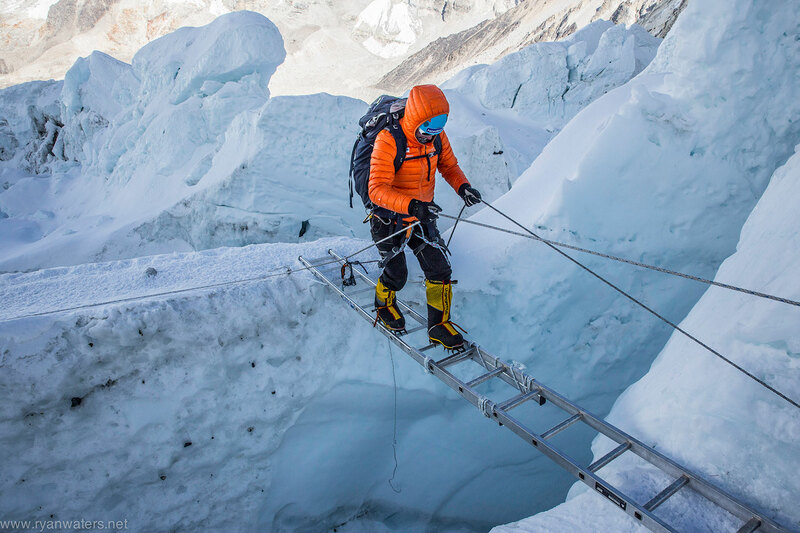 Everest is patience, good organization of logistics, perseverance and little luck from the weather. 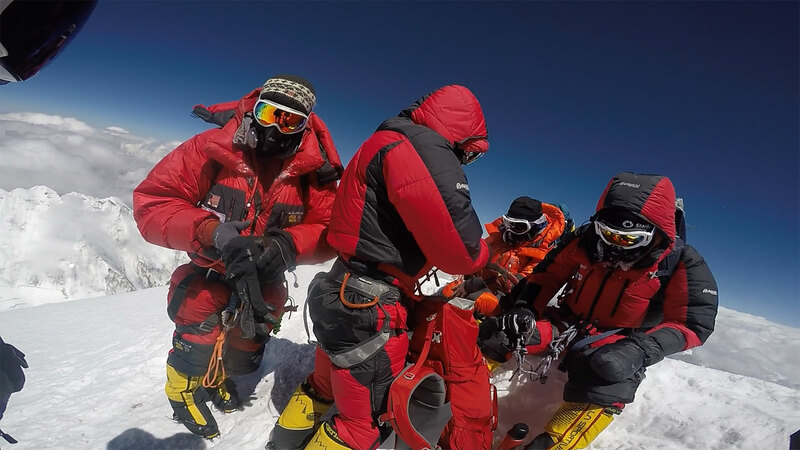 We feel that being part of a strong team on Everest has great advantages for reaching the summit. 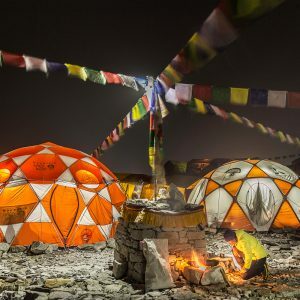 Our expeditions, although led by professional mountain guides, has a feeling of relaxed efficiency, with two-way communication between the staff and the team members. 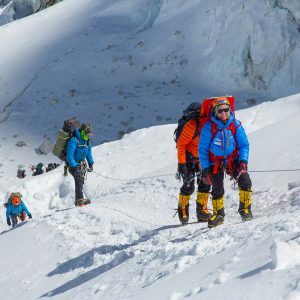 We feel there is a huge advantage to joining a small, highly organized group of climbers, led by our staff to manage all the on mountain logistics and risk management. This ensures that you can concentrate on climbing Everest and can rely on the experience of the expedition leader. Ryan, Thank you so much for taking such good care of my husband while on Everest. He says ‘Ryan is the guide of guides’. He has always spoken highly of other guides so this means he really thinks much of you and your ability to teach and lead. Daralene B. Wife of Everest Summiteer Al B. We will meet in Kathmandu, Nepal for our team organization and final preparations. We spend several days in the city to rest, visit local sights, and prepare. We will take a domestic flight to the village of Lukla and begin our 9-day hike to basecamp. 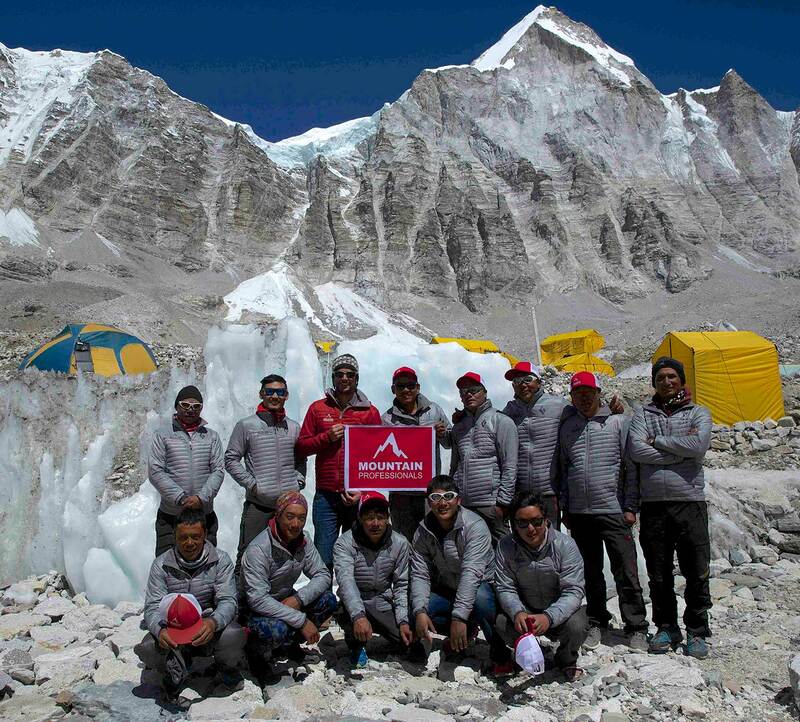 Our goal is to reach the 17,000 feet basecamp feeling strong and ready to begin the climb. 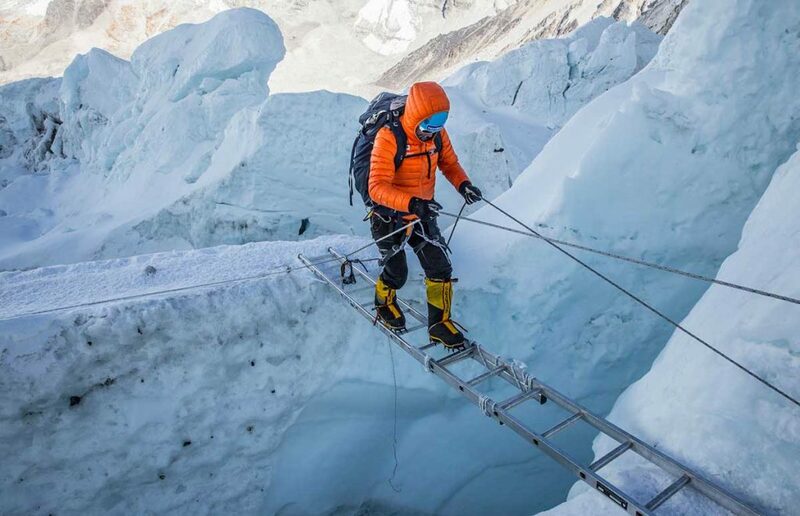 The route from Base Camp climbs through the Khumbu Icefall to Camp 1 at 19,000 feet. After sleeping in C1 we return to Base Camp for a rest and begin our planning for the next climb to the higher camps. 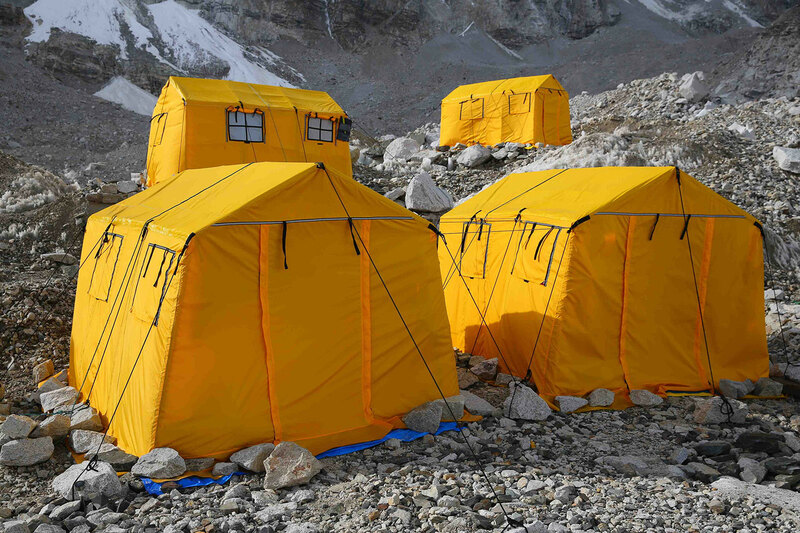 We return to the upper mountain, bypassing C1 and going directly to Camp 2 at 21,000′. Our C2 location eventually becomes an advanced BC where we maintain a comfortable dome dining tent and permanent cook staff. After sleeping in C2 for several days we return to Base Camp. Our last foray up the mountain for acclimatization brings us to the Lhotse Face and we ascend to 24,000′ to Camp 3. This will be our highest sleeping night in preparation for the summit push. Thanks for the hard work, it was a great trip and I would be happy to be a reference for others considering an Everest Expedition with you! 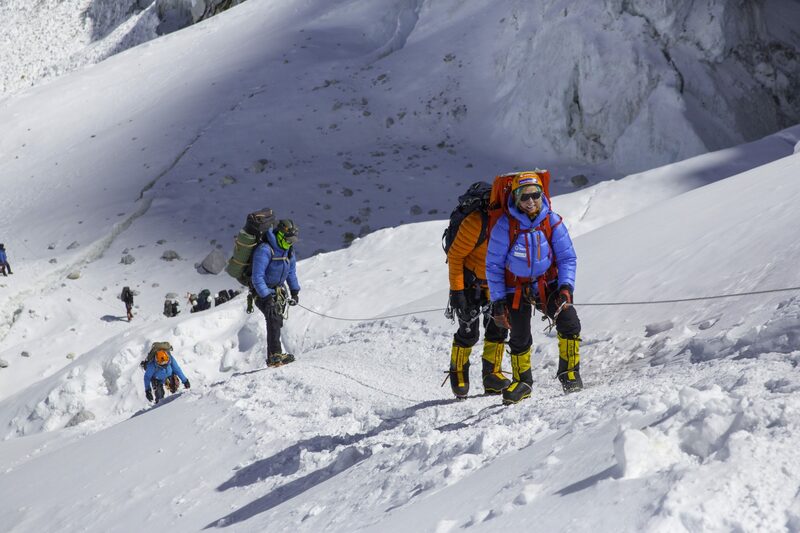 On summit day we climb from the South Col at 26,000′ or Camp 4, up through mixed terrain to the Balcony. Here we will take a break and change O2 bottles. 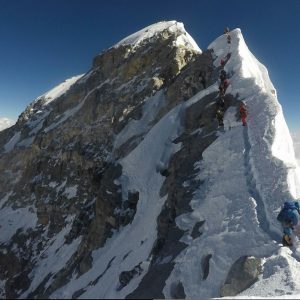 We continue to the South Summit and over the Hillary Step. 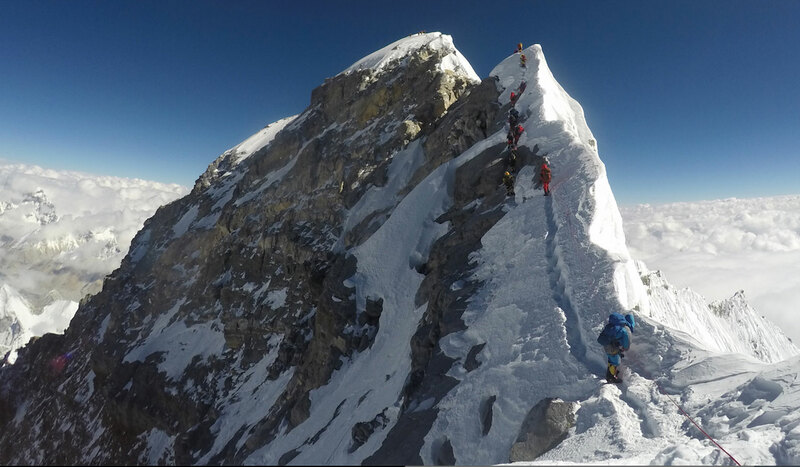 Eventually we reach the most famous of all summits, Everest at 29,035′. This is the highest quality expedition you will find for an exceptional price. All the in-country transportation, the on mountain services, food, tents, yaks, oxygen, and guides are included and are of high quality. 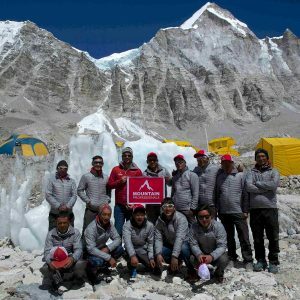 Spring 2018 expedition: Our last expedition to Everest in 2017 put 10 clients and staff on the summit. Day 1: Arrive at Kathmandu Tribuvan International Airport. Our team transports to our hotel in Thamel. Day 2: Relax and enjoy the vibrant city of Kathmandu. Some organization of personal gear and needs. Day 3: Private team meeting and logistical/gear needs. Team dinner and celebration. Day 4: Internal Flight to Lukla and trek to Phakding at 8,700′. Day 5: Today we hike to the Sherpa town of Namche Bazaar. 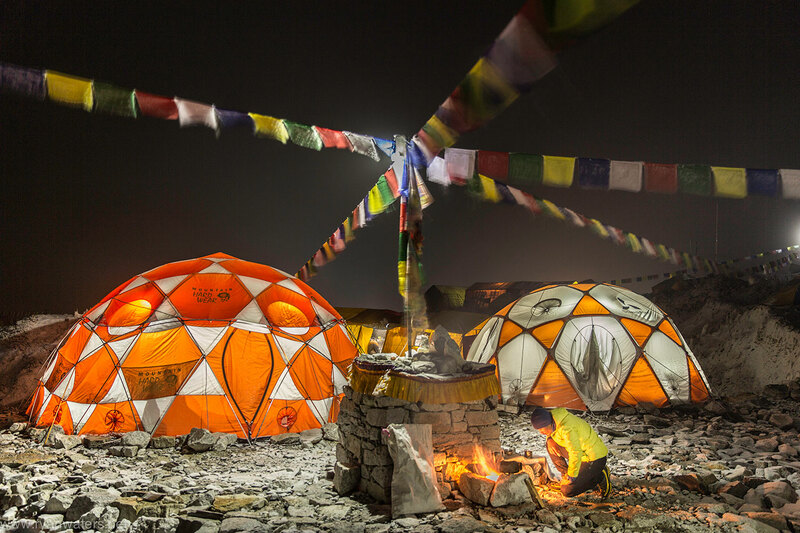 Here we visit the city and experience the people in the Sherpa Capital at 11,300′. Day 6: Here we take another day in Namche to carefully acclimatize. We can take a museum tour or trek around the hills of this beautiful location. Day 7: We will hike along the Dodh Kosi River and eventually make our way through the Rhododendrons to the Tengboche Monestery, sleep in Deboche. 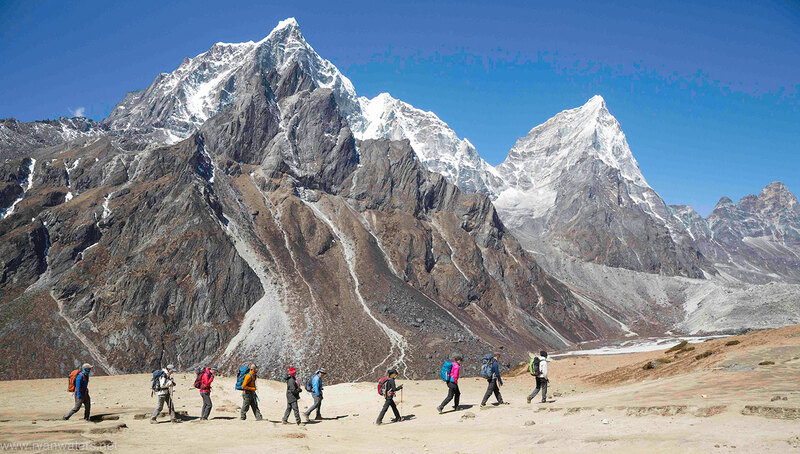 Day 8: Today we hike to Dingboche at 14,000′ and view the famous Ama Dablam. Day 9: We will likely take a rest and acclimatization day here to ensure good health. 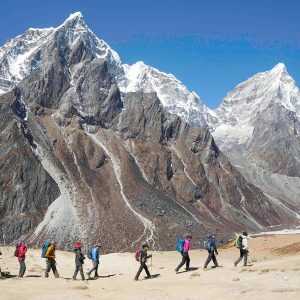 Day 10: We walk along the Mani Stones and climb to the small village of Lobuche at 16,000′. Day 11: If weather permits we trek to the top of Kala Pattar and get stunning views of Everest, tonight we sleep in Gorak Shep at 17,000′. Day 12: We make our way to Everest Base Camp at 17,500′. Day 13-54: This is our climbing and summit window; we carefully pick the most stable weather and make our attempts sometime mid to late May. Day 55-59: We have carefully planned in extra time to allow for a late weather window and to take down our camps and pack up. We also travel back to Kathmandu during this time. Day 60: Departure to home country. 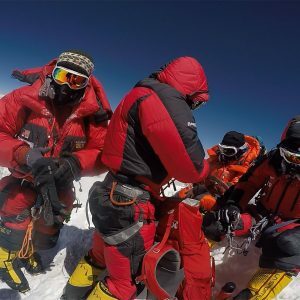 1:1 Nepali Sherpa climber to client ratio. Four nights private accommodation in the Kathmandu at the Yak and Yeti hotel. Full board on twin sharing basis on the Trek at high quality teahouses. All transportation in Nepal as per itinerary. Yaks, porters, and guides to and from Base Camp. Sherpa cooks, kitchen and climbing staff at BC and Camp 2; equipment allowances, daily wages, insurance, and food. Carry bonus for Sherpa staff. Free Unlimited Base Camp and Camp Two Wi-Fi via Thuraya XP+ hub. Heated and Carpeted- Dining Dome, full kitchen, shower and toilet tents, chairs and tables at BC and C2; Esspresso/Coffee, comfortable BC environment and high quality food served by our kitchen staff. 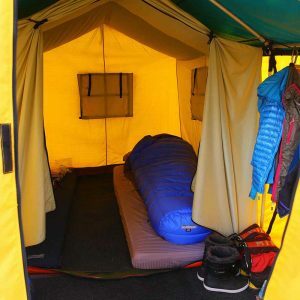 Personal 6x7x7 foot box tent for base camp with carpet and bed mattress. 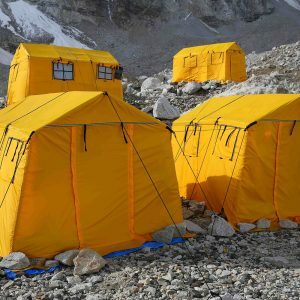 Mountain Hardwear Trango 3 mountain tents. Communications Tent, with access to email, projector with movies. Imported US and European food at BC; equipment allowances, daily wages, insurance, food and lodging for Liaison Officer and Interpreter. Icefall and all route fixing costs. 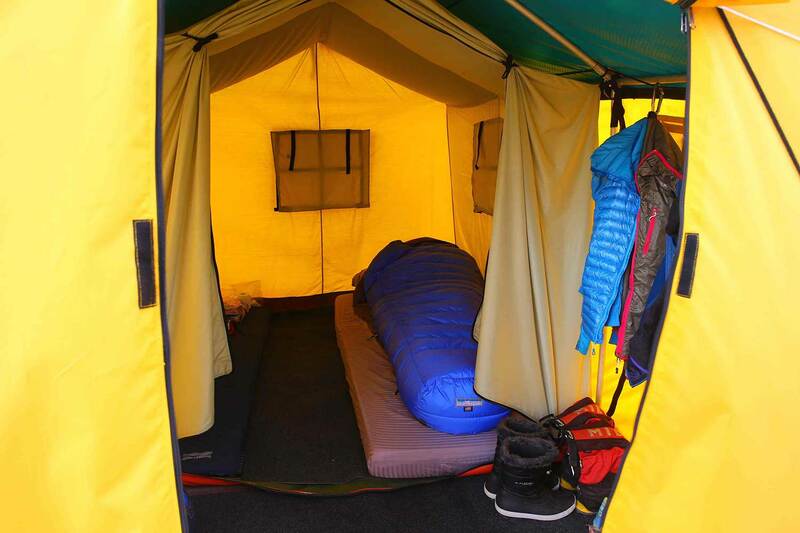 Group climbing equipment, high altitude tents, stove and fuel; high altitude food imported from the United States. Two way radios and VHF BC to mountain communications; full BC satellite phone communication setup. 5 bottles of oxygen and use of Summit Oxygen mask and regulator. Comprehensive medical supplies and Wilderness EMT/First Responders. Weather Reports provided by World Wide Weather Expeditions. Meals in Kathmandu, outside of team dinners before and after expedition. Drinks, laundry, postage, telephone calls and all other items of personal nature. Pre-trip medical exam by doctor, required by Ministry. Personal climbing clothing and equipment. Optional Pre-Summit drop down rest in Namche.